Secondly, I hope the title of these cookies alone is enough to convince you to try them. Because, I mean, c`mon...pumpkin + Biscoff? It`s magical, people. :) I have yet to meet someone who doesn`t like this incredible Biscoff/speculoos cookie spread. I`m sure I`m not the only one who has this cookie spread as a staple in the pantry (along with crunchy peanut butter and Nutella)! I love my Biscoff crunchy, just like how I like my peanut butter. Of course, you can use whichever variety you have. Hehe. Then, I decided, why not amp up these cookies some more? Like...make them pumpkin biscoff snickerdoodles? Why not stuff them with candy? What about white chocolate chips? The ideas just kept on coming! So, I tried them all. 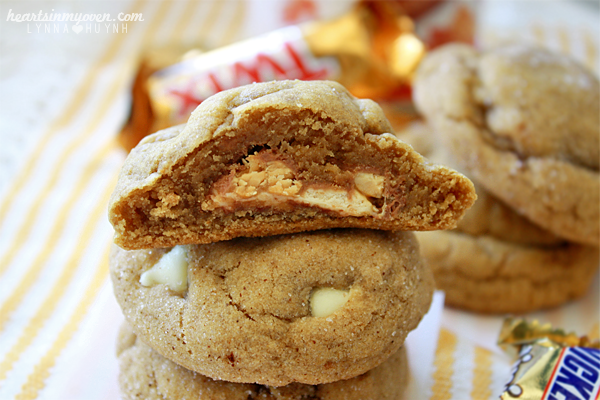 I stuffed some of the cookies with chopped up Twix and Snickers since Target had a sale on them. Who am I to deny a CANDY SALE? I seriously have NO restraint when it comes to candy. Zip. None. If you want to go all out and stuff them with Nutella, or use chocolate chips, or drizzle some melted chocolate over them, go for it! The other great thing about these cookies, aside from the fact that they`re amazingly awesome, is how long they stay soft and chewy. 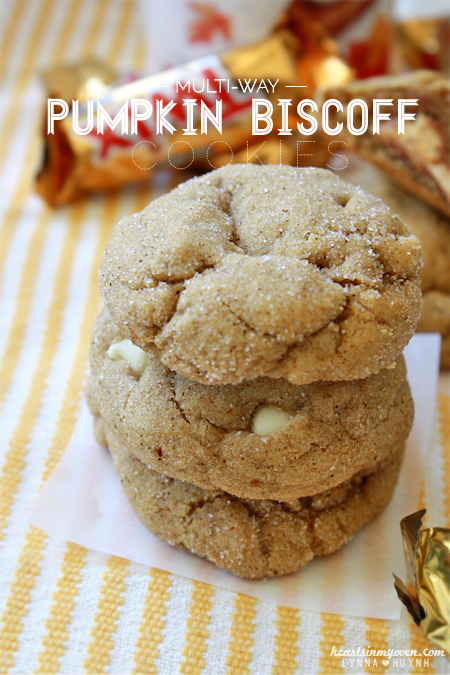 The pumpkin, Biscoff, and brown sugar really give these cookies that thick and chewy texture. You can make them days in advance and they`ll keep well. 1. Line baking sheet(s) with baking mat or parchment paper. 3. In the microwave, melt the Biscoff spread, about 15 seconds, depending on your microwave. Let it cool. 4. In a large bowl, whisk together flour, baking soda, salt, pumpkin pie spice, and cinnamon. 5. In another large bowl with an electric mixer, beat brown butter, melted Biscoff spread, brown sugar, and sugar until combined and smooth. 6. Beat in the pumpkin puree. 7. Add egg and vanilla extract and mix to combine. 8. Gradually add in the dry ingredients (flour, etc) and mix until combined. 9. Chill dough in freezer for 15-20 minutes/fridge for 30-40 minutes. 10. Preheat oven to 350°F while you wait. 11. In a deep bowl, whisk together sugar and cinnamon. 12. Using a cookie scoop, roll dough into 1 inch balls. 15. Using a rubber spatula, fold in your white chocolate chips. 16. Using a cookie scoop, scoop dough onto baking sheet. 17. Place onto prepared baking sheet, about 2 inches apart. 18. Bake for 8-10 minutes, rotating baking sheet 180°, halfway through baking time. 19. Allow cookies to sit on baking sheet for 5-10 minutes before removing to cool completely on cooling rack. - Cookies will be really soft freshly baked, but will harden as it cools. - You can do many things with this cookie base. Try all three, or just one! It's completely up to you. - If you decide to use candy bars, there is no need to freeze them beforehand, but you can if you want to. - Cookies will stay soft for several days, stored in a covered container.